I’ve never enjoyed making amigurimi (aka softees, aka toys) – nor have I ever been good at them. 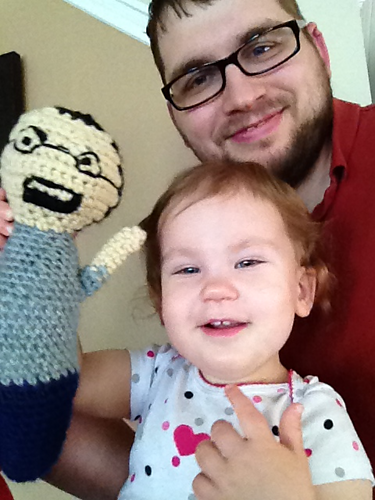 But, situations seem to arise when people know you can make things out of yarn and request toys of some sort. I guess it started with the phallic lip balm cozies… and then donuts for a work gag… then toys for friends. I guess that’s where it started to take off. A coworker saw my sad attempt at Star Wars toys on Facebook and asked me to make some for her on commission. I got a little better at it. Meaning, these aren’t AS horrible as my first attempts. 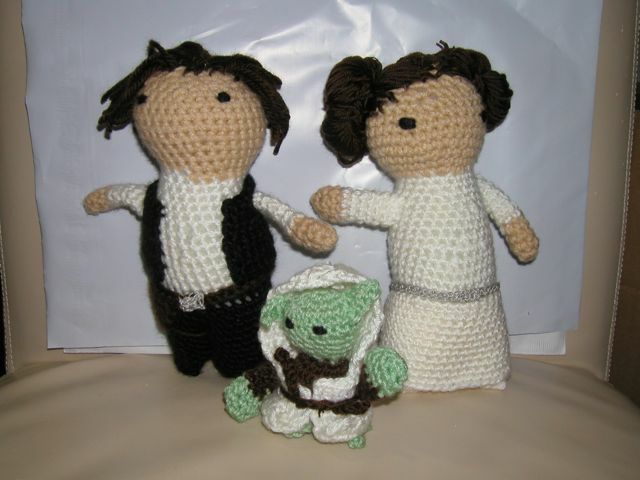 Han Solo and Princess Leia were made using patterns by Sammi Resendes of “Geek Central Station”. I made a few other toys for friends and charity… and then one day had an idea. 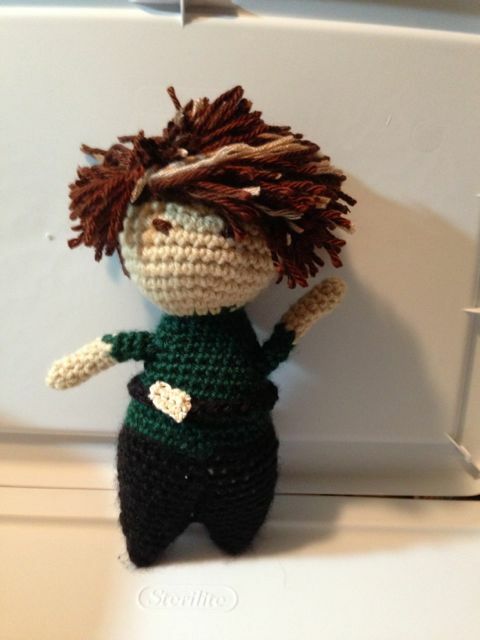 I no longer know if this idea was great, horrible, or just strange… but I adored my personal trainer-coach at the time, and decided to make a yarn version of him. The Geek Central Station pattern starts with a “basic” pattern, then adds details to make the doll look like Han Solo or Princess Leia – I’d just use different details to have the yarn doll look like Ron – kind of. Then, after a while, I needed a mini-me, right? I used the mini-me for my profile picture on a few sites, including Fitocracy. I guess because they’re “novel”, people started asking about them – including the guy I’d “dueled” in the past. He challenged me to a second duel, and wanted a doll if he won. He won. More people asked about them – and wanted them. I was uncomfortable with setting a price on them (it takes 10-25 hours, I’d have to ask $150 to $250 for a doll to make it worthwhile.) So, the easiest thing seemed to be to barter for them – or duel for them. 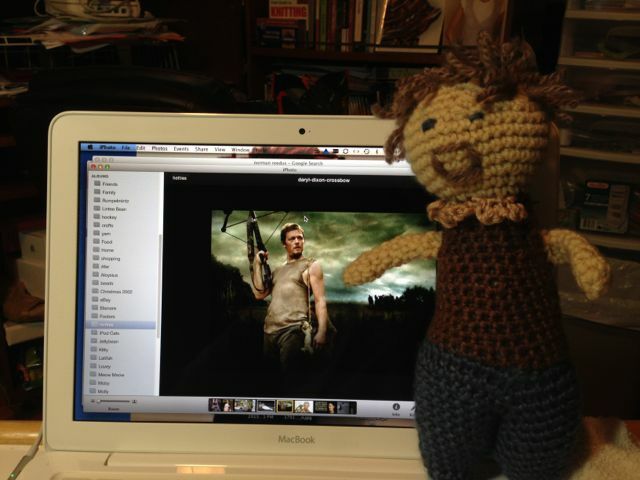 Which is how I landed up making a “Daryl Dixon” doll (Norman Reedus’s character on the Walking Dead – super awesome crossbow carrying zombie killer) as well as KillerLine and EnsignGirl – more Fitocracy “friends”. How big are the dolls? They’re about 11-12 inches tall. How long does it take you to make a doll? Well, it depends. I don’t time it – but I’d guess it takes 10 to 25 hours. It depends a lot on the detail, whether I get things right the first time, and how much hair is involved. Hair, especially, can take forever. For hair like LinteeBean’s, I have to make EACH strand of hair separately – so that’s a lot of yarn cutting and attaching (with a knot) then trimming. How is a doll made? 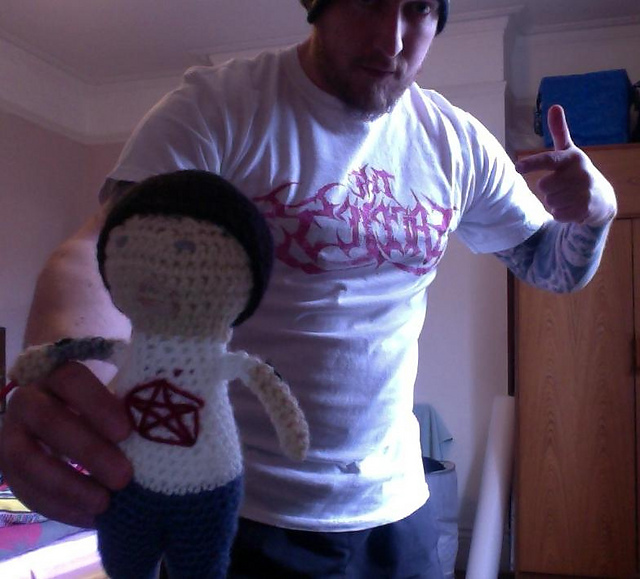 I crochet it, starting with the Geek Central Station’s basic pattern. Clothes are sewn on, most aren’t removable (with rare exception, like KillerLine’s hat). I basically start with the legs, then make two little arms, then add the torso and hear on to the legs and sew the arms on – then add all the details. It’s stuffed about half way through the head part. It’s all yarn – I don’t like using beads or buttons in case a child or pet gets at them. This also makes it possible to throw it in the wash if that child or pet gets at it. How much does a doll cost? How much does it cost ME? Well, there’s the yarn – if I had to go out and buy (cheap acrylic) yarn to make a toy, it would probably cost me $15 to $20 depending on how many colors I have to buy – plus the fiberfill I use for stuffing. In many cases, I have remnants of yarn in my “stash” that I can use. For most of what I’ve made, I’ve only had to go out and purchase flesh colored yarn – because if I don’t have it on hand, it’s not like I can substitute green or purple. How much does a doll cost? How much would it cost YOU? I haven’t figured out a great answer to this question. 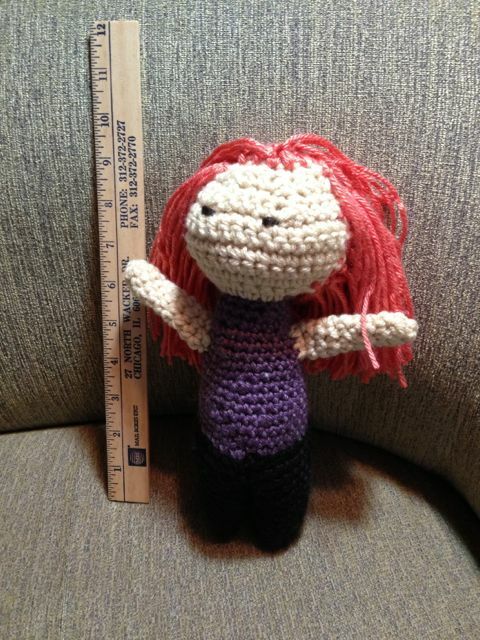 People don’t seem to understand that offering me $15 to make them a doll is NOT motivating. That barely covers cost of materials – let along 15-25 hours of my time. I enjoy crocheting, but I’d rather crochet a blanket or a garment – not a toy. I just don’t rally enjoy making toys. They’re small and fiddley. To make it worth my time, I’d have to charge $150 to $250 for a yarn doll. 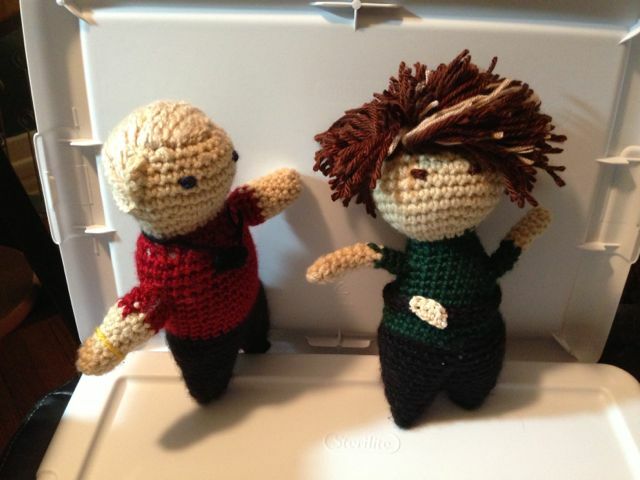 Unless famous celebrities start wanting fugly yarn dolls, I’m not convinced people will pay that much for a doll… but if you are, PLEASE, use the contact on the About the LinteeBean page to shoot me an email! so you’re saying you’ll take $17.50? You are amazing. I think your dolls are amazing and when I am rich and famous I will commission a whole set. Wow, aren’t you the sweetest thing? Thank you!